German Chamomile is a dainty annual plant that produces masses of small white daisy flowers with a yellow centre. The flowers can be dried for making chamomile tea. Each packet contains approximately 1000 tiny seeds. German Chamomile grows wild over a large range and is native to parts of Europe, Asia and Africa. The dried flowers of this species are the most common ones found in commercial chamomile tea mixes, although other species are also sometimes used. To make chamomile tea place two teaspoons of dried flower heads in a cup, pour in boiling water and steep for 10 minutes. The cup should be covered if you wish to prevent the evaporation of volatile oils that may have medicinal benefits. A weak concoction of tea that has been left to cool to room temperature can also be sprayed over seedlings to help prevent dampening off disease in susceptible varieties. The flowers of German Chamomile can help to attract beneficial insects to your garden and will add beauty if planted throughout a vegetable garden. Chamomile seeds are tiny and should be sown no deeper than 4mm deep. In Australia sow German Chamomile from September to November or from March to April. German Chamomile seeds take 8 to 15 days to germinate. Try not to over-water germinating seeds or seedlings as they are quite susceptible to rot. Space plantings or thin seedlings to about 20cm apart to give them room to grow. 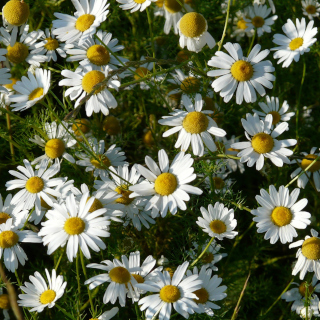 German Chamomile grows best in sandy, well-drained soil but will tolerate a wide range of growing conditions. Chamomile plants don't normally require any additional fertiliser be applied, however if the growing soil is particularly poor an organic fertiliser, such as well rotted cow manure or garden compost, can be dug though the soil prior to planting. Although German Chamomile will still flower in light shade, choose a growing site in full sun for optimum flower production. In warmer climates Chamomile plants may suffer in full sun so instead choose a planting site that ideally receives shade from the hot afternoon sun. Chamomile takes 3 to 4 months from sowing to commence flowering.